The Golden LEAF Foundation helps rural students further their education throughout the state with its scholarship programs. At its June Board meeting, the Golden LEAF Board of Directors awarded $775,000 to the North Carolina Community College System (NCCCS) to help approximately 2,000 students in the 2018-2019 school year. Brittney Hurley of Lansing, NC in Ashe County, is an example of a student working hard to get the skills needed for meaningful employment. 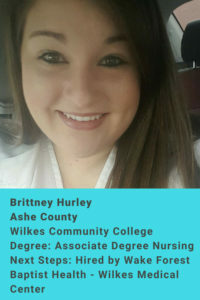 Hurley graduated from Wilkes Community College in May 2018 with an associate degree in nursing. She was able to use her Golden LEAF Scholarship to assist with transportation needs to and from clinical sites. Upon graduation, Hurley was hired at Wake Forest Baptist Health – Wilkes Medical Center and starts her new job this month. 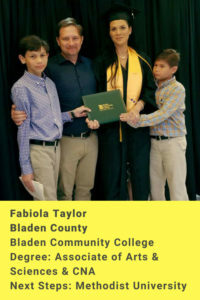 Fabiola Taylor, May 2018 graduate of Bladen Community College, is working hard to create a better life for her family as well as her community. Fabiola Taylor earned certified nursing assistant (CNA) degree and has an associate of arts and sciences degree. She is from Dublin, NC in Bladen County. She said she was able to use the Golden LEAF Scholarship to help pay for her uniform and boots for her clinical rotations while getting her CNA. Fabiola Taylor is attending Methodist University in Fall 2018 and plans to get a degree in biology and then pursue a career as a physician assistant. Morgan Taylor of Tarboro wants to be a local business owner and is willing to work hard to reach her goals. 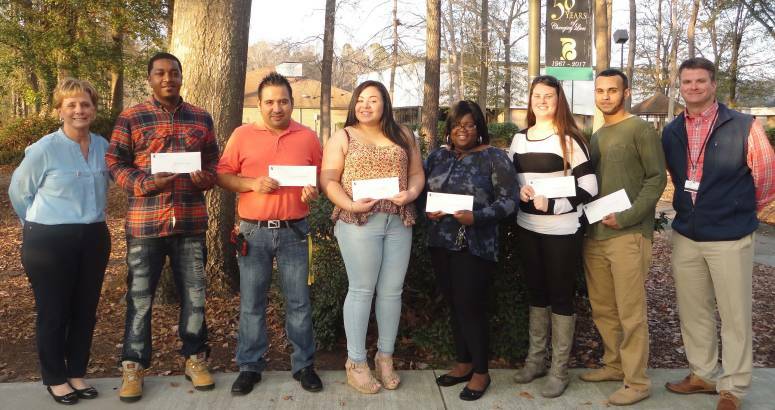 She received the Golden LEAF Scholarship in Fall 2017 and Spring 2018, while attending Edgecombe Community College. Morgan Taylor said her scholarship helped her with expenses such as paying for books and other costs of attending college. She plans to finish her undergraduate education and work toward a master’s degree. 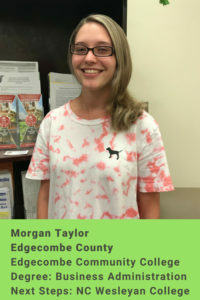 “My long-term goals are to finish my education that I need in order to be successful in a career and to live a healthy and financially stable life,” said Morgan Taylor. She graduated in May 2018 with a Business Administration degree and will be attending North Carolina Wesleyan College in the fall to pursue a four-year degree in business. The Golden LEAF Scholarship – Two Year Program provides up to $750 per semester, including summer term, for curriculum students and up to $250 per semester for students enrolling in occupational programs. Awards can be applied toward tuition, fees, books and supplies at the community college where the recipient is enrolled, and to transportation, child care expenses related to attending classes, and mid-skills credential testing upon course completion. Each participating college will set the deadline for the scholarship application. Contact your college’s financial aid office as soon as you plan to enroll to determine application deadlines.